MK Shannon's Heart of Gold was presented to Cher at Ceasar’s Palace in Las Vegas by the Children’s Craniofacial Association (CCA). We are all familiar with the wonderful entertainer that Cher is—singer, actress, and great performer. What is less known is that Cher has a big heart when it comes to children with facial abnormalities. And that led her to support the Children’s Craniofacial Association as their National Spokesperson and to establish “Cher’s Family Retreat” which is held every year. Since her first involvement with the organization after making the movie Mask, Cher has become the association’s most generous contributor. She has also developed personal relationships with many children who have craniofacial conditions, following their surgeries, and calling them personally to offer friendship and encouragement. CCA's mission is to empower and give hope to individuals and families affected by facial differences. We envision a world where all people are accepted for who they are, not how they look. All of us at MK Shannon Awards were thrilled to be a part of making that special moment. How Green Are Your Awards? Eco-friendly practices are a good thing, and–it’s no secret–an important consideration in planning a conference, meeting, or convention today. MK Shannon Awards & Rewards and our most important business partners have worked together to reduce the footprint we leave on our planet. As it turns out, good earth-friendly practices are often good business practices, too. We continue to look for ways to minimize our use of resources and to offer you the highest quality recognition awards and service. Some pewter used for awards in the awards industry does contain lead, as does all glass crystal. The pewter used in casting MK Shannon sculpture awards is the highest quality pewter available and contains no lead. All cardboard is recycled, and the foundry has implemented a program for its industrial neighbors to conveniently recycle their cardboard at the foundry site. All metal scraps are collected and recycled for reuse. Effective shipping materials for the sculpture awards are critically important for delivery of the awards in good condition. The foundry uses a variety of materials for shipping, choosing the greenest materials that will guarantee a good delivery of the awards. Only fans are used for cooling the casting and finishing area of the foundry to minimize energy usage. No impact from commuting–no added gasoline consumption, pollutants, or congestion. Whenever possible, we minimize the use of paper in favor of electronically storing data and other information. This reduces the usage of toner, as well as paper. All paper and laser cartridges are recycled. All MK Shannon employees are very conscious of the need to conserve our resources and individually implement practices in their own offices that support that goal. MK Shannon no longer uses a printed catalog, minimizing use of paper and ink products. 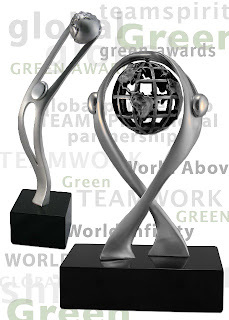 With Green Awards in mind, we have designed two new awards that express our feelings about this new world we live in. They are World Above and World Infinity. Here are the Artist’s Notes about their concept and inspiration. World Above: This single figure sculpture award was conceived to express that feeling of accomplishing above and beyond, to capture that sense of "out of this world." The figure is open and this refers to the concept of an individual being open to new ideas, new thinking, and new ways of being in the world. This design honors those who are a world above and a world apart from their contemporaries. World Infinity: The world is infinite, endless, and continual. We as individuals struggle to grow, to learn, to achieve and to accomplish in an ever-changing planet in an ever-changing world. This sculpture illustrates the importance of partnership, of teamwork, of sharing and caring. These figures reach out to one another for support and connection. In that moment, through that movement they become more than they are alone, they become stronger and brighter and offer hope for a better world. This recognition award captures the spirit of teamwork or global partnership. Los Angeles, CA. Each fall, the Fulfillment Fund hosts one of the largest Los Angeles area benefit events, raising over $2 million to assist economically disadvantaged students graduate from high school and college. The STARS Benefit Gala honors a leader in the entertainment industry for his or her extraordinary generosity and philanthropic involvement. 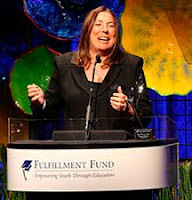 The Fulfillment Fun d selected three custom awards designed by MK Shannon to recognize their honorees. This year the honoree is Thomas Tull, Chairman and CEO of Legendary Pictures. This year also includes a special presentation of the Gitnick Visionary Award to Shelley Freeman, Regional Vice President of Wells Fargo Bank, and the Inspiration Award to Andrea Cockrum, Founding CEO of the Fulfillment Fund. The STARS Gala is a popular Hollywood celebrity event. Leading celebrities serve as entertainers and presenters, and have included Ben Stiller, Jamie Foxx, Steve Martin, Vince Vaughn, Warren Beatty, Annette Bening, Roger Daltry, Calista Flockhart, Kate Hudson, Salma Hayek, Quincy Jones, David Hyde Pierce, Sidney Poitier, Denzel Washington, Stevie Wonder —and many, many more. This year the Master of Ceremonies was Ryan Seacrest, John Fogarty provided entertainment, and Kate Beckinsale and Christian Bale were speakers, along with others. "Working with MK Shannon Awards gives you the opportunity to present a unique piece of art to an honoree. The sculpture tells a story and embodies a value that you are expressing to the recipient. What a meaningful way to show your appreciation at an event! We were very pleased to work with you." Stacy met us at last year’s Association for Fundraising Professionals conference. She said she was blown away by the uniqueness of the awards displayed in our booth. She immediately recognized that our awards stand out from the rest and would have more meaning to their recipients. “Your sculpted awards are pieces of fine art,” she said. She also loved the idea that each piece had the artist’s notes about the inspiration for the piece and that they were quality awards that people would prominently display in their homes or offices. She knew that it would be important for their organization to present something beautiful and unique, not just a piece of glass or crystal. LOS ANGELES, CA. The National Association of Television Program Executives (NATPE) recently presented MK Shannon’s “Brilliant” award to Nigel Lythgoe the executive producer of American Idol. Rick Feldman, NATPE’s President and CEO made the presentation and Mr. Lythgoe accepted the award on behalf of American Idol’s producers. The gala reception and presentation was hosted at The Annex in the Hollywood & Highlands Entertainment Complex. NATPE created the Reality Innovator Award to recognize outstanding achievement in reality programming. Recipients of the award showcase extraordinary passion and leadership, leveraging their platform in new and innovative ways. “Idol Gives Back” is a huge music celebration and fundraising event produced by 19 Television and Fremantle Media. Idol Gives Back has raised millions of dollars during the last two seasons for various U.S. charities that deliver support to underprivileged children in some of the most disadvantaged areas of the country; providing them with medical care, food and grocery products, health and life skills and literacy programs, among other important initiatives. In Africa, funds are dedicated to organizations that support efforts to battle poverty through various health and education programs, including delivering medical supplies and providing clean water. "’Idol Gives Back’ is an extraordinary example of the ability of television to combine the power of celebrities and the corporate community in raising awareness and money for social enterprise," said Rick Feldman in making the announcement. "We're honored that Nigel Lythgoe will be on hand to accept this award." And, we at MK Shannon Awards & Rewards are equally honored that our Brilliant will shine for a worthy event! 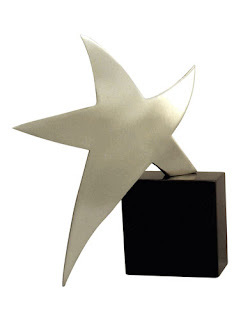 Our Brilliant award was designed to give a different twist to the usual Star award. A fresh look with a large marble base which can be customized with a name, date, and logo. See specifics on this recognition award: Brilliant! 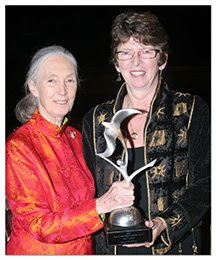 On November 7, 2008 in Washington DC, the Jane Goodall Institute held its second annual Global Leadership Awards Celebration presenting each honoree with a commissioned award designed by MK Shannon. 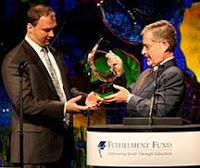 This year’s award recipients were US Representative Tom Udall for Excellence in Public Policy, Pierce and Keely Shaye Brosnan for Responsible Activism in Media and Entertainment, and Green Mountain Coffee for Corporate Social Responsibility. In addition, the Youth Leadership Award winners included Manoj Gautam of Kathmandu, Nepal, Emily Woodall of Banner Elk, NC, and Tayler McGillis of Toluca, Il. The master of ceremonies for the evening was Anderson Cooper, host of CNN’s Anderson Cooper 360. Academy award-nominated actress Abigail Breslin and her brother, actor Spencer Breslin helped present the Youth Leadership Award.